It’s nothing juicy, scandalous or diabolical. What if they are turned off, when they find out (eeeeeeeeek!) ……I love to knit. Even on really busy days, there’s usually a small window of opportunity for a little knitting. It’s something that fills my cup, in some strange way. I don’t just do knitting, it’s part of my psyche…I am a knitter. Subtle but real difference. The only thing I don’t like about knitting is when I make a big mistake and have to “rip out” a bunch of stitches in order to go back and make it right. If I don’t take the time to fix it, there will be a constant nagging that drives me nuts until I give in and return to the scene of the crime. In an especially intricate pattern, it may take a lot of time to undo what I’ve done and fix it, but it will be worth the time and effort eventually. Before I understood the way knitting works and how knitted stitches are ‘woven’ together, it was nearly impossible to fix a BIG mistake. It could mean giving up on a project (perish the thought!). After I learned and understood the mechanics of knitting, I was no longer intimidated by my mistakes, and could handle them in a more creative fashion. I also learned that knitting without mistakes is unrealistic, no matter how hard I try. What if we look at Love in the same way? Learning about Love, and the science of it, helps us become more responsible for our behavior and actions. We start creating more attractive patterns in our relationships because we have a new understanding and freedom to apply Love’s beautiful spectrum of the 10 Vectors* to our daily lives. The textures, combinations and individuality of people and circumstances we encounter now become opportunities to express creativity in Love’s domain. We wake up each day with anticipation and joy in our new purpose; to Love others. Just like knitting, the fabric of life has some unwanted holes, big mistakes, and spots that are really messed up sometimes. Unlike yarn, life doesn’t let us go back in time to undo mistakes and fix them. But Love does have a remedy. The Technology of Love, explains that Forgiveness is one of the more difficult and misunderstood of Love’s elements (found within the Pillar of Knowledge, Love’s Director). It’s a thinking method, a knowledge process, an internal occurrence, rather than an action. Forgiveness is strictly a matter within the thought purview of the offended individual, and is first restorative of the injured individual; secondarily restorative of the offender. It does not absolve the offended individual or the offender from the responsibilities of justice—or from the protecting function thereof. …Nevertheless, the Forgiveness of Love generally cannot extract anything from the offender; indeed it must give Love to the offender if possible. It is the generation of Love that heals quickest and cleanest. The last defense is to mount an offensive of Love, especially to those we have loved deeply and hope to do so again. In many cases, this involves almost a constant tone of Forgiveness. Thus Jesus’ example of extending Forgiveness “seventy times seven” by one brother to another. (The Technology of Love, C.E. Hansen, p. 101). Love does allow for and encourage us to ‘go back’ and apply forgiveness to areas in our lives, or relationships that are still bothering us (causing us or others pain). We can at least mend some mistakes, and even hope for restoration in some cases. The journey has to begin in our own thinking. And with that comes the ability to try and avoid the same mistakes in the future, and to be more creative and less intimidated in our application of forgiveness. So, whether it’s knitting… or Love, the goal is the same: We want to bring something stunningly beautiful, passionately pleasing, warm and wonderful to the fabric of life. Don’t just do Love…Be Love. *The 10 Vectors (from The Technology of Love) are Care’s 10 Action Elements, fully explained in TOL, chapter 10, The Mathematics of Love. A special thanks to our reader, Kent J. for his input regarding the ‘spectrum’ of the 10 Vectors. Great analogy using spectrum of colors. The sweater represents the sum total of your love vectors in yarn directed to someone who is going to receive a nice sweater. Each of the colors of yarn in your knitting basket can be thought of as one of the 10 Love Vectors as defined by Charles E. Hansen (*). Choosing some colors to being more dominant than others (or left out completely), the same is true when we concentrate on a select few of the Love’s Ten Positive vectors in our “care” for one another. 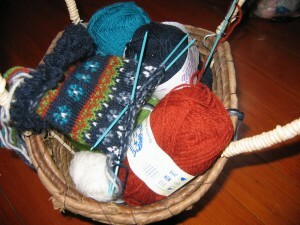 Depending upon who we knit a sweater for, the color pattern will vary to fit the relationship. (*) The 10 Positive Love Vectors: Attentiveness, Listening, Thanking, Praising, Encouraging, Comforting, Assisting, sharing, Contributing, and Protecting); Love is a subset of Care. ON A TECHNICAL NOTE: As a person with a technical background, who has read both books, “Gimpy’s Secret”, and “The Technology of Love”, and spoken with the author Chares E. Hansen, let me expand on this to help explain exactly what Chuck means by a “vector”. The [Name]; If everyone who knits goes through their knitting basket and picks out their 10 favorite colors….each color say represents the [name] of one of the 10 Vectors of Love, starting with [Attentiveness]…through to….[Protecting]. For example Red for [Attentiveness], Blue for [Protecting], etc. The [Direction]: You want to knit a sweater composed of colors; each [color] is directed to say your [Grand Father]…. or indirectly some colors or a “smiley” pattern to get a laugh from the [great grand children]! The [Intensity]: You decide that you want to use, [10 yards] of blue; [ 1 yard] of red and [2 yards] of white. Here intensity is measured in yards, not miles per hour. The sweater will have an over all intensity of [high] blue but [low or lower] intensities of red and white. We could have a range of say, high, medium, low; or if we like, a broader range of say 1 to 100 on a scale of 100 for example. Now applying what we have learned, making a sweater using various combination of colors for someone, it is no different than how we use a unique combination of the 10 Love Lectors to express our love for another person. This helps us understand how love is expressed differently whether it is directed to a spouse, a sibling, a friend, or stranger; but it still an expression of love. So “I love you” means different things to different people. By understanding Chuck’s vectors we begin to better understand what that difference really is and quantify it. So the total sum of all love vectors with associated intensities results in our expression of love for someone. Of course we are not masters at applying all 10 vectors, so we often concentrate on some and overlook others which may produce different results…like too much attention, or excessive praising, or over assisting or on the opposite hand forgetting to praise or to encourage, etc. If we are lucky just a few key love vectors is optimum for a particular person we love. CONCLUSION: The brilliance of Chuck’s work is that he defined love as consisting of 10 Positive Vectors. This allows scientists and academics using mathematics to better study what is happening and model better out comes for our lives. In practice these same tools were used to land our astronauts on the moon and return. But don’t worry! We do not have to be rocket scientist to understand and apply the 10 vectors of love to everyday life. As Chuck so eloquently points out in his book, the master of applying all 10 vectors of love was Jesus; He is our Teacher. Love is a skill; like knitting..or painting, or gardening, it doesn’t require “rocket science”. Thank you Kent, for your great insight! We hope you’ll continue to join the conversation…and maybe even consider doing a guest post! Is there anything for the benefit of your readers that you feel needs to be discussed on the technical level concerning Chuck’s work? Other wise I have something in mind which ties together chuck’s work to a very important area that few people are aware of, a nation’s grand strategy and survival. The Technology of Love confirms and helps understand historical precedents of application at this level. I’ll send you a short synopsis later as I better formulate the discussion. Kent, I love 🙂 how you have explained, so colorfully, the action elements of Love, (vectors) and the intensities. You, obviously, get it! I’m formulating something for a “Guest Post” and will cc you as I progress. I briefly discussed it with Chuck during his call yesterday, and he liked my idea. It relates chuck’s work to a very important area that few people are aware of, a nation’s grand strategy and survival. The Technology of Love confirms and helps understand historical precedents of application at this level. Happy Thanksgiving to the family.